With a rusted fragment of the World Trade Center beside them, Belleville leaders marked the 12th anniversary of the terror attacks that killed more than 3,000 Americans. 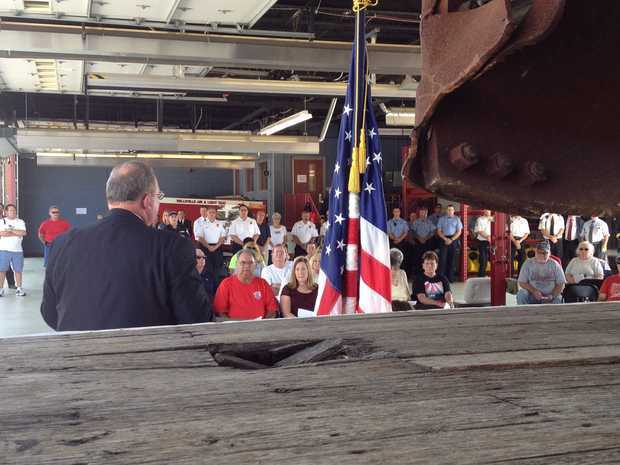 About 150 people attended the second annual 9-11 Moment of Remembrance Wednesday at the Belleville fire administrative offices and Firehouse No. 4 on South Illinois Street at Illinois 15. Belleville firefighters and police officers were joined by other local emergency responders and residents. Sharon Strausbaugh, vice chairperson of the committee for the September 11th Memorial Walkway of Southern Illinois, said next year will be even better, with the memorial expected to be completed on the fire department grounds. "Next year we have a big ceremony planned with bagpipes and special guest speakers. We will actually be able to dedicate this wonderful memorial to the victims and survivors," she said. The memorial is expected to be the largest outside of New York City. "Plans are to break ground this spring and dedicate the memorial on Sept. 11, 2014. We need an additional $50,000 before we can break ground. After that we have many in-kind donations, contributions of labor and materials," Strausbaugh said. "We are ready to go, just need the last $50,000 to be able to break ground and finally get this project going, where people will see progress as they drive by." Belleville Mayor Mark Eckert was joined late Wednesday morning by Fire Chief Scott Lanxon, Police Chief Bill Clay and guest speaker the Rev. Edward Weston, of Union United Methodist Church in Belleville. They recalled those who died, including honoring the first responders who evacuated much of the Twin Towers before they crumbled when terrorists rammed jetliners into them, the Pentagon and failed to strike a third target when passengers took back United Flight 93 and crashed near Shanksville, Pa.
Belleville obtained a 7,100-pound steel beam from the World Trade Center and is raising money for the memorial walkway to display it. Other observances on Wednesday included an observance at Southwestern Illinois College, volunteers in Mascoutah making crafts for first responders and veterans in hospitals, as well as first responders hiking up the stairs at Cahokia Mounds to remember their comrades who climbed the Twin Towers on a rescue mission from which they never returned.